For those planning new homes or buildings and wanting to make them as energy efficient as possible, straw bales present an interesting option. Take a look at this home, featured by American Clay Enterprises. 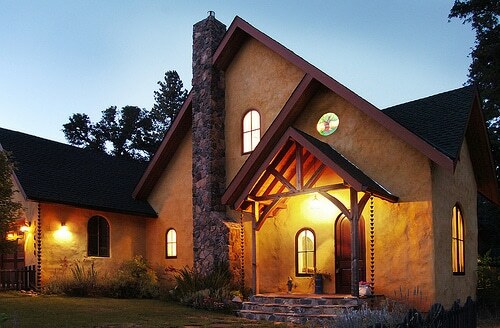 Made with renewable and energy efficient material, this home was built with StrawBale walls and American Clay Plaster. American Clay is an all natural earth plaster made from clay, aggregates, and natural mineral pigments. The use of StrawBale helps homeowners save up to 75% off heating and cooling costs, aids in being fire resistant, and minimizes wood consumption, giving consumers an even greater reason to be environmentally responsible. American Clay installed onto StrawBale increases the durability of the home and allows the home to become one of the most environmentally friendly homes that can be designed.